Super Mario All-Stars+Super Mario World Redux attempts to fix some of the issues found in the original game. Some issues like: Why the heck does Yoshi have orange arms? And what in the WORLD of ugly-creeps is that Bowser?! Well, fear no more. Yoshi now has its normal green/yellow/red/blue arms (depending on the coloured Yoshi you get) and it also changes the colour of Bowser to closely match its original design. 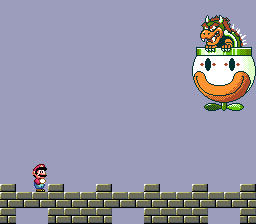 With that, Super Mario World now has more faithful sprites according to their original design. Also, this hack fixes the typos for the character names found in Super Mario Bros. 2 (carried over from the NES original), as well as changing Mario and Luigi’s hand colours in SMB3 to white to resemble gloves, since the original beige coloured hands was a mistake or an overlook by the developers since both Mario and Luigi have white gloves in minigames and in Super Mario Advance 4 as well. Even more! As an added bonus, thanks to codes by user “rainponcho”, Yoshi can now eat dolphins once again like in the Japanese counterpart of Super Mario World! Note 1: The colour palette used for Bowser/Yoshi is still the same as the original, the colours in the sprite have been changed, NOT the palette itself. 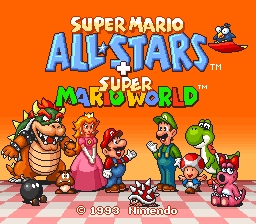 Note 2: The patch is solely for the All-Stars+World ROM due to the improved sprites for Luigi and other minor stuff. There are 2 variations of this hack, with one including two neat bonuses (credits to BMF54123 and spiffy). Check README.txt for the patch version history and other information. Note: Both patches require a headerless base ROM of SMAS+SMW. 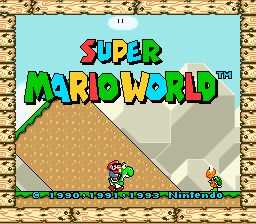 This hack is also compatible with the SMAS+SMW - Title Screen Mod hack by DarkSamus993. Use Floating IPS and patch it over the already patched ROM of this hack, simply ignore the “Fail” message and open up the saved new ROM generated by FIPS. That should do it! ShadowOne333 Original Work Creator of patch / graphical work. DarkSamus993 Hacking Added a 'clean' version of the patch. BMF54123 Original Work Creator of the 'Brick Fix' patch. spiffy Original Work Creator of the 'Switched Overall Colours' patch.